Tony Needs To Return to Seattle for further care. Many of you are aware that our good friend, Tony Nash, husband and father, is battling multiple myeloma. A stem cell transplant is his best hope for a return to good health. Unfortunately, even though Tony has health insurance that will cover part of the costs, this will still be very expensive. My wife and I first met Tony several years ago when he was dating our dear friend, Mishelle. In May of 2014, I had the privilege of officiating at Tony & Mishelle’s wedding. Anyone who knows Tony knows what a great person he is. He has spent his professional career helping people find the inner strength to overcome devastating addictions. He’s a loving father, step-father, and foster parent to a total of 10 kids. Through all that, he keeps himself in better physical shape than anyone I know, never complains much, and gives a lot of thought to figuring out the right thing to do for others. Tony is constantly helping others – it seems like that’s just his default setting. This time, we need to help Tony. He is scheduled to have a stem cell transplant within a couple months’ time. It will be in Seattle, at a medical center that has handled many cases like his. They will be using his own stem cells, which they will extract after Tony has undergone an intensive round of chemo. Once his body receives the transplanted cells, he will have a long recovery period, during which he will have to spend a lot of time in Seattle and undergo monitoring of the transplant’s success. While this procedure doesn’t fully cure the disease, it gives Tony a good chance of being able to manage the disease and return to a much more normal life. Tony’s family needs help to cover substantial costs for him to stay for weeks at a time in Seattle, as well as to cover repeated travel for Mishelle, and the portions of his medical bills that are not paid for by his insurance. To help with the financial burden of Tony’s uninsured expenses, a fundraising campaign in his honor has been established with Help Hope Live. To make a donation that is tax-deductible to the full extent allowed by law, click Donate Now. On June 12, Tony will return to Seattle to undergo a battery of tests to restage his cancer and see what comes next. Please keep him in your thoughts and prayers. We are nearing the one year post transplant mark. Tony is thriving, though there have been set backs at time. He had to stop maintenance therapy due to the extreme side effects it was having on him and has had to have extensive dental work due to the damage to his teeth from the high dose chemotherapy. He has good days and not so good days but he is still moving and shaking. We return to Seattle for a full work up and restaging of the cancer in May. All warm thoughts and prayers welcome. Day 120 post transplant. Back in Seattle to be restaged and see where we go from here. Tony keeps smiling despite the pain and discomfort of the tests and bone marrow biopsies and we keep trudging along. Thanks for all your prayers and support. Tony is on day 22 in Seattle and is on phase 3 of 6 of the transplant process. Tony is undergoing an autologous stem cell transplant, meaning he is his own donor. He spent yesterday and is spending today in apheresis, collecting his stem cells to be frozen and saved for the actual transplant. On day 9 in Seattle. Tony is undergoing the pre-transplant evaluation. When all the tests are in the team will go forward with starting the process to do the stem cell transplant. Due to unforeseen circumstances with our insurance company, the stem cell transplant date is on hold. It appears we will need to transfer care to OHSU in Portland and utilize the providers there. This is a difficult decision as the Fred Hutch Cancer Institute in Seattle is the best of the best but we have to have insurance coverage for the procedure. We ask for lots of prayers as we move forward. The stem cell transplant is scheduled. Tony will check in to the Fred Hutch Cancer Institute on April 14th to start the process. Please help us raise the funds for his relocation and housing costs and keep him in your thoughts and prayers. Tony was diagnosed with multiple myeloma on December 4, 2015. Tony currently is undergoing chemotherapy treatments twice a week and dexomethazone steroid treatments weekly as he works towards an autologous stem cell transplant. He and his wife Mishelle are very giving individuals. 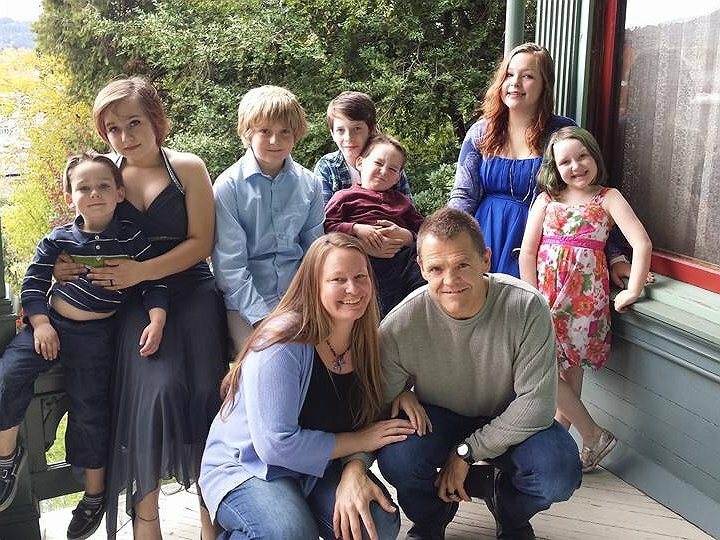 They are biological, adoptive and foster parents and are currently raising ten children. Please help them raise the funds to meet his uninsured medical costs. Tony yo... I wish a had a million bucks to send your way... but I think even my token amount is a vibrational positive step. All love your way. Thank you for being you. I met Tony in Albany nearly 20-25 years ago. Tony, you have always been a kind hearted man of integrity, with compassion for others. And concerned and helping others. I am grateful to know you, to see you and Mishelle walk together through such a challenge. I believe in miracles...and your healing. May all that you need be granted. Keep up the humor, strength and courage. You inspire us all. You are a blessed friend, always. Tony, you're in a great place. Our son had a bone marrow transplant at Fred Hutchinson 30 years ago. He is one of their longest living survivors. Best wishes for a complete healing and know you have people out there rooting for you. Since the time we first met (camp for foster children and families) we knew you we a special family. Prayers for Tony and the raising of this money, we Pray that all will run smooth and you all will remain strong in this trying season. Keep fighting the good fight! Your testimony will continue to inspire, long after the scars are faiding! Love you tons good friend!